Edited by Attila Roka . Implantable cardiac pacemakers have been utilized for more than 50 years now. Continuous development transformed them from rudimentary, asynchronous pulse generators to sophisticated devices with advanced diagnostic and therapeutic capabilities. Implantable defibrillators and biventricular devices, treating malignant tachyarrhythmias and dyssynchrony, use a similar technology. As initial issues of bradycardia-related pacing got resolved, new issues have been recognized, such as the deleterious effects of chronic right ventricular pacing or high risk of complications due to utilization in a frail patient population. Evidence-based practice guidelines were initially developed with a focus on indications and contraindications. Safe utilization of implantable antiarrhythmia devices begins with proper patient selection; implantation method and technique, device programming and follow up are also important aspects that determine the outcome. Lack of high quality data, which could guide these decisions, leads to large individual and geographical variations. Recently, expert consensus documents addressed several important topics, such as follow-up or end-of-life considerations, however, further research is still needed to provide a basis for a more uniform, safe therapy. This book reviews several current issues and recent advances in pacemaker therapy. Improving safety of implantation is of utmost importance to decrease complications. Transvenous route became the standard approach for antiarrhythmic cardiac device implantation as it poses only a minimal burden to the patient. Cardiac resynchronization therapy can still be challenging from this approach due to highly variable individual anatomy – recently, interventional and minimally invasive surgical methods have been developed and studied in detail, with great success. 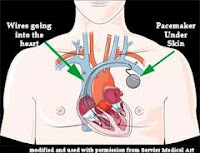 Although the risk of severe periprocedural complications is low for pacemaker or defibrillator implants, there are still dreaded consequences, such as endocarditis or lead perforation, which may be lethal if not addressed in a timely and appropriate manner. Transvenous lead extraction revolutionized management of these complications. Other common issues encountered during follow up include unnecessary right ventricular pacing and atrial fibrillation, with its potential to interact with device function. Several new algorithms have been introduced lately to address these issues – familiarity with these may prevent misinterpreting appropriate device function as malfunction. Patients are frequently seen by multiple healthcare providers in various settings, and questions may arise whether the implanted device contributes to, or is responsible for the clinical presentation. As device-specific programmers are not always immediately available, routine diagnostic modalities, such as a 12-lead ECG should be evaluated first as these may often identify or rule out a potential issue. Multiple ongoing research projects address potential applications related to implantable cardiac arrhythmia devices: studies on nonlinear cardiac dynamics, mobile telemonitoring and phrenic nerve stimulation in patients with diaphragmatic paralysis will be reviewed, displaying the potential of the technology beyond antibradycardia pacing. my family – wife, Erika, and children, Fruzsina, Alice and Adam, who provided a supportive environment while working on this project.